 I was contacted a while back by a gentleman by the name of Mark who had told me he had some excellent footage of a UFO, or an unknown object which he took on August 11, 2003 using his new JVC mini DV, GR-d90 camcorder. Mark's wife was the first to take notice of the unusual object. She was standing in her kitchen at the time. She moved quickly onto the deck of the family's home and was surprised, or should I say shocked to see an unknown object hovering over the trees close by. She said it flipped over and it turned a bright blood red. She screamed to her husband to come quick to watch this strange thing in the sky. As he arrived on the deck he saw a cigar shaped object. He thought quickly, ran back into their home and grabbing his brand new camcorder he scanned the sky for the object and began filming. Eventually when he lost sight of the object he went back inside and played the tape over and over. To his surprise and everyone else's .. what he saw completely shocked him. Mark quickly contacted Peter Davenport at the NUFORC in Seattle, Washington in the United States to file a report and told Peter what he had caught on tape. Mr. Davenport passed the report onto myself (HBCC UFO Research) and Gavin McLeod. Gavin made arrangements with Mark to visit him and take his report and to view the video footage. A couple of days after speaking with Gavin, Mark sent out a portion of the footage to myself, Gavin McLeod, Mr. Jeff Rense and a number of others who may have found the Quick Time Player UFO footage of some interest. 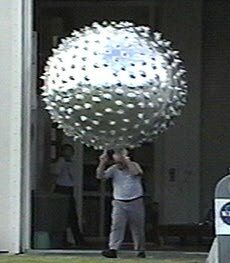 Many did find it interesting but one immediately ruled it as "a helium filled foil balloon". "This material below is from my observations of this tape." Mark and I corresponded and discussed the video footage. In one of our telephone conversations he mentioned that he'd not bothered to slow the tape down. When the running speed of the footage was slowed down greatly, some interesting things started to appear. Mark suggested sending me a copy of the original tape he'd filmed so that I could have a better look at it. When it was slowed down it was apparent that this was no ordinary "helium filled balloon". Mark was still filming when the object left his view.... however when the film was seen slowed down .... it was still there. It had moved rapidly across the sky. One blink and it would be missed ! Suddenly in the distance one can clearly see it re-appearing and entering the camera's field of view looking like a white dot in the sky. As it travels a great distance to the east, over a good portion of the sky, with a reflection that could have been caused by the sun ... it finally disappears. What it does next is very interesting. From out of the east (its position where it disappeared) .. it reappears, still glistening, and travels west at a steady pace. At one point it makes a complete stop.!!! Then it moves south towards Mark's position. When using the Quick Time Player to view his footage one can notice that Mark zooms in on the object and catches what looks like an aura surrounding it ... for a short period of time. He also films what may be the underside of it, until it slowly moves away, turning on its side, taking on a clear saucer shape and it appears to be discharging a dark unknown substance. The strange discharge occurs twice. One from the left side of the object and the other from the right. Again Mark tries to find the object in the sky but can't seem to locate it. He zooms back out and finds nothing. He continues his search zooming out and in and for a split second he captures it once again in the very spot he was searching and where previously there was nothing. The camera again picked the object up and it seemed to come out of nowhere and was gone again as quickly as it appeared. I found it interesting when viewing the footage that the day before, on August 10, 2003, Mark was filming his family's visit to the Abbotsford Airshow, which is a major happening every year and draws aircraft from all over the world. The video footage clearly shows an aerial display of known aircraft taking place the day before the sighting happened. One other note I would like to make, which I found to be very important also, was the remark made by Mark's mother-in-law who was speaking in her native Romanian tongue as she watched the object perform in the sky. She made a comment and Mark translated for me... "the bottom of it has turned brilliant bright red". 1. The object makes extreme sharp maneuvers. 3. At one point in the video, the object comes to a complete stop and hovers. 4. The bottom of the object changes it's color to almost a blood red. 5. The object ejects a black substance on two occasions. 6. In some parts of the film it travels at an extreme rate of speed. 7. In one portion of the tape the object looks like it has an aura around it. 8. There were a number of witnesses to this sighting. What the object is for sure I am not certain. It was extremely interesting, extremely puzzling, and who knows what it was.?? I spent hours viewing the video .. over and over again.... at all types of speed to try and determine what it might have been .. all to no avail. I enjoyed it immensely and found it very exciting. With Mark's permission I will be forwarding it on for further examination. Thanks to Rick Kelvington and Dave Nelms for submitting. version that eliminates the blocking and keeps the sky all blue. Hi -- the video was taken Aug.11, 2003. My wife spotted something in the corner of her eye, while she was in the kitchen. around 6:20pm. ( pacific standard time). She went out on the deck, she saw a round object hovering over the trees, she said it flipped over and it turned bright blood red, she yelled for me, I came out and saw a cigar shaped object, I then ran back inside, to get my new camcoder, when I looked, I could see it with the naked eye. I pointed the camcoder, I had a hard time locating it at first, it was flying very fast, and I had a hard time keeping up with it, while looking in the view screen. I was shocked, I thought it was a balloon or something, and I was going to have a good laugh -- well needness to say I wasn't laughing when I reviewed the tape. I'm using a JVC mini DV, GR-d90 camcoder, I purchased it two days before the sighting. 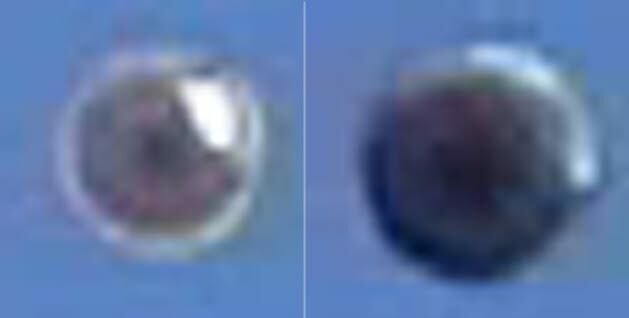 Speculations are being made that the above video is nothing more than a common mylar balloon. However, examination of such balloons will reveal that they are nothing alike, save for being circular in shape. Just letting you know I think you guys are losing your discriminative edge when it comes to UFOs. 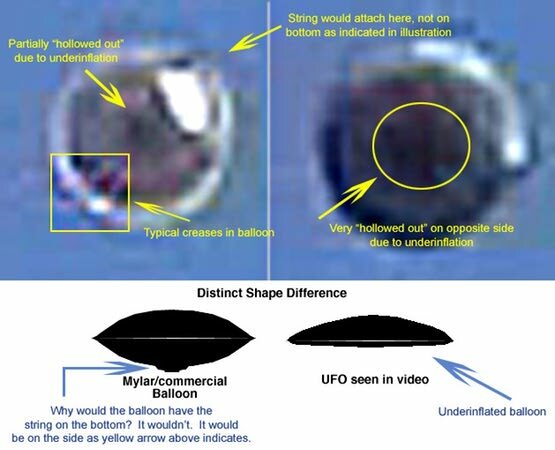 That "UFO" is a Mylar balloon and not a flying saucer. 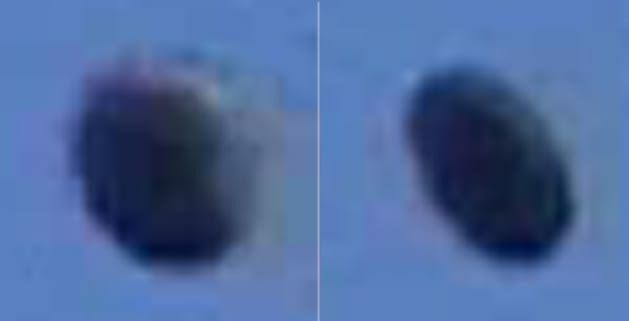 I've seen them in the sky on several occasions and what is shown in the video is exactly what they look like. Notice it just goes up and up and twirls around nice and slow. Notice the edges are those of a sealed, but partially inflated balloon. Since when does a typical Mylar balloon have the cord at the bottom as the image illustrates? Not the kind I've seen. I'm not talking about a Mylar balloon made to look like a UFO, I'm talking a regular Mylar party balloon without a string. They are slippery and on more than one occasion I had to return to the flower shop to get a new one as they slip from the string rather easily if not tied well. I think this is a video of a typical runaway Mylar balloon that is rather underinflated, thus giving a more "flattened" appearance on one side. You can even see the creases in it. It's a balloon! You guys debunk "blurfos" but stand behind this? Wow. Some of George Ritter's images are more compelling than this. P.S. Despite my critique of this, I do love your site! You still have the best information available on the Web. Keep up the great work! Well, your examples and graphics and logic are all admirable, but I still have to challenge you on this, Peter! First, you've misunderstood one element of my graphic, which is the 'commercial' mylar balloon on the left (I gave a URL for an example of these, but I guess it was still a bit confusing)... they are rather large (anywhere from 4 feet to 12 feet in diameter) and have some kind of small fan/motor device as a gondola attached to the bottom, which is also part of the balast to keep it level. The "string" element would apply only to a mylar party balloon -- I wanted to clarify that. I was not illustrating a "party" balloon. And therein lies the rub! The videotape we have received to date of such silver ships cannot be mylar 'party' balloons as they would need to be extremely large to appear as they do on the tapes; 20 feet or more. The typical party style mylar balloon is usually no larger than about 3 feet in diameter. I've seen dozens of detatched mylar party balloons floating in the sky, large and small. They don't resemble these videos in the slightest. The size difference is one aspect. Another is, an underinflated mylar party balloon -- much less a large commercial balloon -- is not going to have the kind of altitude these discs show on tape. These are clearly very large and too high up to be small party balloons, even when zoomed in. You are also at hand dismissing the eyewitness account. I see no reason to do that unless you know something we don't about this person and their claims. Also, I have yet to ever see a mylar party balloon maintain, even for a short distance, level, horizonal status. They always tip up on edge and usually stay that way, short of a few strong gusts that might make them tumble end over end. That's just plain ole' fashioned helium physics. Additionally, a mylar balloon so deflated would tend to bend and buckle on itself. What we're seeing in these videos are silver discs that are remaining horizontal, that turn and pitch and right themselves again. Release a few underinflated mylar party balloons and see what you get. They drift off turned on edge, just as they are designed to do (usually because there is a message printed on them) and even if carried aloft to a reasonable altitude (which usually won't happen), they will stay that way, looking like... well... an escaped mylar party balloon. Now here's one that might freak out a lot of people!! !